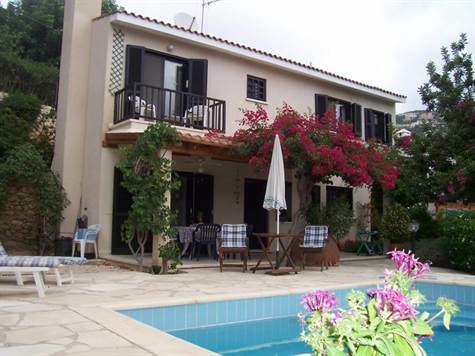 Cyprus Property Blog by Cleo : Price Just Reduced - Bargain in Kamares - Detached Villa only 139,000! BARGAIN! Just Reduced in Kamares! Kamares, Paphos - This beautfiul detached villa features 2 bedrooms, 2.5 bathrooms, a spacious open plan living and dining room. The modern kitchen with a pantry for extra storage leads out to a veranda. The living room also leads to a relaxing patio setting that is covered by a large pergola topped with bougainvillea flowering plants and an outdoor overhead fan.